In 1858, when the population of the county was but 624, in the midst of a winter which was unparalleled for its cold and snow, Rev. J. M. Rust came from Lewis, Cass County, and preached the first sermon ever delivered in Greenfield. The place where the services were held was the house of S. K. Mallory and the congregation but a handful of worshipers. Reverend Rust was a graduate of the University of Virginia and died at Vermillion, Dakota Territory, in the winter of 1869 from exposure in attending a quarterly meeting. During the summer of 1859 Reverend Hulbert, who was traveling the Quincy circuit in Adams County, came over and preached several sermons in Greenfield. On one of these occasions he organized the first class, composed of the following ten persons: S. K. Mallory, leader; Samantha Mallory, Hugh W. Wilson, Sarah A. Wilson, Seth Wilson, Emily A. Wilson, Martha Wilson, E. V. Myers, Samuel C. Vance and J. S. Rich. This little band of worshipers maintained regular services at the house of S. K. Mallory, or at the house of Hugh Wilson, which stood just west of where the United Presbyterian Church later stood. Rev. Samuel Osborn, a local preacher, labored quite regularly for the little society. The work as organized by Mr. Todd was named Adair Mission and was composed of the following preaching appointments: Greenfield, Fontanelle, Roots, Wahtawah, Salem, Manchester, Nevinville and Middle River. The charge thus formed was placed in the Council Bluffs district, Rev. I. I. Stewart, presiding elder. The first quarterly meeting was held in Greenfield on December 17, 1859, Rev. I. I. Stewart presiding; Rev. J. W. Todd, pastor; official members,, Samuel Osborn, William Shoemaker, S. K. Mallory and John Easton. At this meeting a committee, composed of the pastor, William Shoemaker and John Easton, was appointed to secure lots for a church and parsonage in Greenfield. There is no record that they ever made a report, but from incidental facts it is inferred that they secured the lots now owned by the church in Greenfield, as it appears that at the third quarterly meeting, an agreement had been made with one Bennett Sparks to erect a parsonage, which agreement was afterward cancelled and the enterprise abandoned. In 1860 Rev. Arthur Badley was chosen as the presiding elder and Reverend Levan was appointed in charge of the circuit. As Levan received only $13.46 as his salary for the first quarter, he left the charge, and was compelled to refund $6 of the small salary. Samuel Osborn was then employed by the presiding elder to supply the charge temporarily, which he held until March, 1861, when N. H. Phillips was employed to serve out the year. At a meeting of the board of trustees held in Greenfield May 4, 1861, Samuel C. Vance was chosen trustee to fill the vacancy caused by the removal of Reverend Todd and held that official position for some years. Brother Phillips was successful in pushing forward the completion of the parsonage. This historic building was 18 by 24 feet in size and 1½ stories high. The carpenter work was done by W. T. Baggs of Greenfield, and he received 10,000 of lumber for his pay. Mr. Phillips, who was a local preacher, reported two Sunday schools this year, with thirteen officers and teachers and thirty-four scholars, which is the first mention of this nursery of the church in this denomination. In 1861 and 1862 the Adair Mission was a part of the Lewis district, with Rev. Arthur Badley as presiding elder. Rev. S. W. Milligan was the minister in charge. The appointments were Greenfield, Fontanelle, Salem, Wahtawah and Manchester. The first quarterly conference was held at Greenfield September 27, 1861, when the following members were present: J. S. Rich, Samuel Osborn, S. K. Mallory, John Easton, Phillip Osborn and Hugh Wilson. The receipts for the year, including a missionary appropriation of $75, was only $135.45 for presiding elder and pastor. The annual conference for the year 1862 sent Rev. James Lisle as pastor of the Adair Mission. The first quarterly meeting was held at the house of Samuel Osborn on September 26th. Reverend Lisle organized the first class at Fontanelle during his pastorate in 1862, which class consisted of the following members: Ozias Gibbs, Sally Gibbs, Emily Wilson, Seth Wilson, Martha Root, Maria Snell, Norman Norton, Alvina Norton, Lemuel Lewis and Amanda Lewis. In the fall of 1863 Rev. W. W. Mallory was sent to the Adair Mission. The first quarterly meeting was held at Greenfield on December 26th in the schoolhouse, the first time that it is recorded that meetings were held any place else but in private homes, or groves. At the third quarterly meeting the names of S. Wilson and J. Q. Violet appear as members thereof, and J. W. McPherson was granted a license to preach. At the fourth quarterly meeting held at the Salem schoolhouse Alexander Easton was also granted a preaching license. Reverend Mallory organized the Webster class which was formerly known as that of Manchester, with the following members: E. Edmonds, O. Raymond, Henry Raymond, Seth Pryor and Jane Davis. During the year the following were added, making thirteen members: Sarah Pryor, Lydia Davis, Sarah Witt, Ellen McEferty, Patience Hadley, Elizabeth Etten, Mrs. Bunce and Mrs. Dennis Drake. During the following year Adair Mission was made a part of the Winterset district and the place of pastor left to be supplied. Rev. P. F. Brazee, the presiding elder, appointed Samuel Osborn to this duty, which he performed, although with but meagre results, but the state of the public mind during those war days accounted for that. Nothing of interest transpired during the year. The annual conference of 1865 sent Rev. E. R. Rafter as pastor of the Adair Mission, but he remained but a very short time. Rev. J. E. Darby, a local preacher, was then employed. In his visits to Fontanelle he found no organization nor any members of a former class in that town, so he organized a new class with the following first members: Josiah Bennett, A. H. Mory, Margaret Mory, Sarah J. Brown, A. W. Dorn and Laura Dorn. In March, 1866, Mr. Darby organized a class at Elliott's, composed of members from the Webster and Wahtawah classes. Forty-five members were reported at the end of the year in the whole charge. During the year the parsonage at Greenfield was rented to various parties, the pastor not occupying it. In the fall of 1866 Rev. E. A. Winning, a flying evangelist, with headquarters in the field, was appointed to this mission. His labors, assisted by his wife, lasted for three years. He organized the Jackson class on January 5, 1867. On February 10th of the same year he formed the McClure class, with B. W. McClure as leader. When his term of work had expired he left the church with a membership of 163 and 32 probationers, where he had found only 32 in all. About 1871 he left this part of the country for California seeking for health. The conference for 1869 sent Rev. W. H. Records to the Greenfield charge, as this work was now called. It comprised appointments that year at Greenfield, Fontanelle, Pleasant Ridge, Nevin McClure's and Hazel Green. Mr. Records remained a year and at the close reported a membership of seventy-eight and thirty probationers. The one church property in the possession of the denomination at this time was the parsonage at Greenfield, valued at $450. Rev. A. A. Powers was the next to take charge of this work in the fall of 1970 and the first quarterly meeting was held at Fontanelle on November 19th of that year. The following board of trustees was appointed for Fontanelle: W. R. Buell, H. H. Dart, James Rany, Norman Norton, J. A. Daugherty, J. C. Gibbs and J. J. Hetherington. These men contracted and had built during the summer of 1871 the parsonage of Fontanelle. Powers resided at the latter place and the parsonage at Greenfield was rented. In May, 1871, Powers resigned as pastor and J. E. Jones served out the remainder of the year. During this year the circuit was divided and Greenfield and Fontanelle were made separate charges. At the conference held in the fall of 1871 Greenfield Circuit was supplied by Rev. J. L. Walton and Fontanelle by Rev. F. A. Goodrich. Rev. Mathew Mitchell was the pastor sent to Greenfield in the fall of 1972 and his circuit comprised appointments at Greenfield, Summit, Orient and Nevin. The first quarterly meeting was held in Greenfield December 28, 1872. Rev. M. Sheets was appointed to the Fontanelle Mission in the fall of 1872. In 1873 he was succeeded by Rev. Leon Shaw. In 1874 Rev. William L. Reid assumed the pastorate of the Greenfield Circuit. Rev. J. A. Jefferson was sent to Fontanelle at the same time. In the fall of 1875 Rev. L. Laverty assumed the duties at Greenfield, but leaving during the year, J. W. McPherson was appointed to the vacancy. Rev. Cyrus Smith was sent to the Fontanelle Mission the same year. The year 1876-77 found the Rev. G. F. Couffer on the Greenfield Circuit. During his pastorate a house of worship was erected at Greenfield. The lumber for the house was hauled from Stuart and the contract for the construction let to S. Parker of Greenfield. The total cost at the time was about two thousand dollars and a debt of $400 hung over it. Rev. C. L. Nye took up the work in the fall of 1877. During his first year a Sunday school was organized. In this year the Nevinville circuit was organized. Nevin was first organized as a class in winter of 1864 by Rev. P. F. Brazee, with the following members: George W. Grant, Julia Grant, E. Sawyer, Kate Sawyer, M. Covey, Ruth Covey, N. E. Jewett, Oliver Jewett, Cordelia Jewett and S. E. Gandy. In 1881 a fine church edifice was erected at this place. In the autumn of 1878 Rev. T. A. Lampman took charge of the Greenfield Church. He had found the church in debt, but during his term of service he reduced this debt besides making added improvements. In the fall of 1878 Rev. C. L. Nye was appointed to the charge at Fontanelle. A Methodist Sabbath school was organized this year in the latter place for the first time. In the fall of 1878 Rev. J. R. Welborn was selected to take charge of the new work at Pleasant Hill. His appointments were Pleasant Hill, Eureka Center, Oaks schoolhouse, Prussia Center and Willow Green. He served one year and was succeeded by Rev. Austin Crooks. Rev. Jesse Evans was sent in the fall of 1880 to succeed Reverend Lampman at Greenfield and Rev. J. A. Wilson to Fontanelle. H. H. Badley was appointed to the charge at Orient. L. W. Gary was appointed to fill the rural appointments of the Fontanelle charge. One of the first things done in Fontanelle was the healing of the breach between this church and the Congregationalist, and accepting the invitation of that body to worship in their house. Early in the spring of 1881 a location was selected upon which to erect a church edifice of their own and upon June 24th the cornerstone was laid with great ceremonies by the Masons. But little else was done until the following year, when the outside was erected and enclosed. The interior was not finished until the winter of 1883-4. 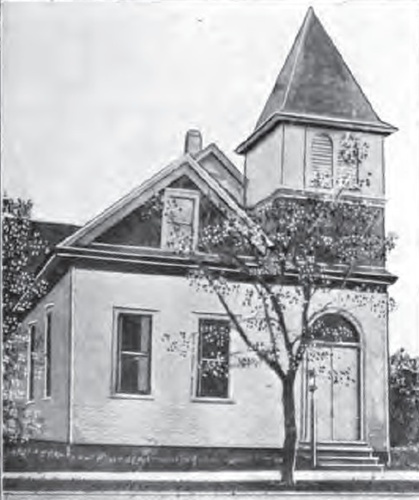 This church was dedicated on January 2, 1884, the dedicatory sermon being preached by Rev. H. H. Oneal, the presiding elder. Rev. A. W. Armstrong came to the Fontanelle charge in 1883. On February 26, 1882, a class was organized at Brook's schoolhouse in the east part of Richland Township by Rev. J. A. Wilson, with the following members: Arthur Mays, Homer Brooks, Mary Brooks, Delilah Mays, _____ Mays, five in all, which class became very prosperous. The Rev. J. D. DeTar followed in the charge at Greenfield. The church at Adair was organized by Rev. T. A. Lampman with thirteen members in 1875. Rev. Lampman was the first pastor and remained in charge for three years. He was succeeded by Revs. George Detwiler, E. Kendall, Edwin Holmes, Simms, A. H. Murphy. The first services were held in the public school building up until 1879, when, in the fall of the year, they began the erection of a church building. This cost $2,000. It was dedicated on February 6, 1880. The three lots where it stood were purchased and given by the Ladies' Mite Society. The Methodist Episcopal Church in Jefferson Township was erected in the summer of 1882, located upon the southwest corner of section 14. The building cost about one thousand six hundred dollars and was dedicated on September 10, 1882. The first religious services in this denomination were held at the house of William Hollingsworth in 1857, at which time a church society was formed with the following members: John and Ruth Easton, Mrs. George B. Wilson and Mrs. John Loucks. At the first the Greenfield people met for worship in private houses, then the old schoolhouse and after that the courthouse where Warren's store now stands. 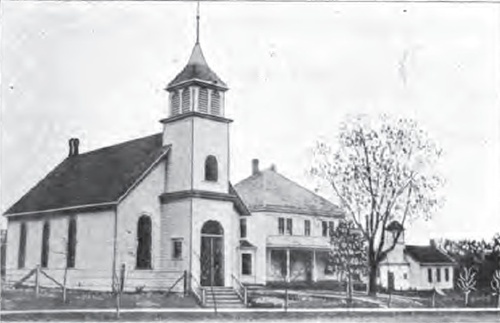 As described before the church was constructed in the town in 1877 and Rev. C. L. Nye preached the first sermon therein. The old parsonage afterwards stood in the role of a barn on the back of the church lot; it was constructed by Rev. E. A. Winning in 1868. The lumber for this building was cut near Arbor Hill. The frame was hewn and pinned and the walnut siding was made in Greenfield. The second parsonage was built through the efforts of Rev. Homer Gaines. The present structure was built in 1898. Rev. J. W. Meredith at that time being pastor, most of the material of the original church building was worked up in the new church. The dedication of this building took place August 21, 1898. The pastors who have served at Greenfield are as follows: Revs. Hulbert, 1859; Levan, 1860; S. W. Milligan, 1861; James Lisle, 1862; Arthur Badley, 1863; S. Osborne, 1864; J. E. Darby, 1865; E. A. Winning, 1866-9; A. A. Powers, 1870; W. H. Record, 1871; G. A. Goodrich, 1872-3; William T. Reed, 1874-5; Laverty, 1876; R. M. Couffer, 1877; C. L. Nye, 1878; T. A. Lampman, 1879; J. A. Wilson, 1880-2; J. D. De Tar, 1883-4; A. E. Griffith, 1885; B. T. Fassett, 1886-8; J. M. Conrad, 1888; C. W. Stewart, 1889; A. W. Armstrong, 1890-1; J. F. Campbell, 1891-3; William M. Todd, 1893-5; W. J. Meredith, 1896-8; J. W. Matheny, 1899; Fred Harris, 1900-2; Conrey, 1902-4; W. H. Cable, 1905-8; H. P. Dudley, 1908-10; Enoch Hill, 1910-12; J. S. Young, 1913-14; J. E. Lombard, 1915-. The Grove Center church was started in 1878, when D. C. Franklin, then pastor at Menlo, came to the old schoolhouse where Grove Center school now stands and held the first revival meeting ever held in all the country. After Doctor Franklin organized the class Revs. Hohenshelt, Voorhees and J. J. Varley were pastors. In 1887 Rev. Varley, assisted by O. W. Lippincott, had the second great meeting. At the close of the meeting a board of trustees consisting of H. F. Hodges, J. M. Humphrey, W. C. McCrea, H. Horn, J. D. McIntyre, W. Plymesser, F. Shirk and Neal Vreeland was formed and in 1888 they secured the money and built a church on the lot where the present structure now stands. this building was struck by lightning in the summer of 1912 and was burned to the ground. After Grove Center became a regular preaching place it was first placed with one charge then another until at different times it belonged to Menlo, Casey, Prussia, Stuart Circuit and Greenfield, and at these different times was served by the pastors of those charges. Part of the time the charge was with Menlo, Rev. W. W. Bollinger, now of Winfield, Kan., was pastor. He, too, has always been an indefatigable worker and a great revivalist and as usual held a meeting at Grove that resulted in eighty conversions and many additions to the church. After Brother Bollinger's removal the church suffered greatly by removals and was about to be given up as a preaching point when Rev. Alonzo Pruitt took charge. The effects of the great meeting at Hoadley and the building of the new church there reinspired the people and thirty new members were added to the church. The work remained with the Stuart Circuit until 1904 when Brother Hohenshelt took charge and placed Grove Center with Greenfield, Rev. A. F. Conrey then being pastor. The elder speaks in highest term of brother Conrey's work. After Conrey came Rev. W. H. Cable, three years; Rev. H. P. Dudley, two years; Enoch Hill, two years, and then the present pastor. After the loss of the building by lightning there was some discussion about rebuilding and as to location, but a building committee was finally selected consisting of Loren Sulgrove, H. F. Shirk, Edwin Horn, W. Plymesser, James Masten and A. J. Bruce, and with the assistance of David Wilson the money for the new building was subscribed in one week. These men have labored with untiring energy and as a result one of the most convenient and beautiful country churches in the district now occupies the former site. There was an unusually good meeting during the winter of 1913, but the following spring a number of families moved away, and this loss was felt. Some of these have returned and others have become more active and the church at present is in good condition. It was dedicated June 14, 1914. The church at Clara Chapel had its beginning in 1877. In that year, at the request of John Gillis, preaching was conducted and a Sunday school organized at the old Bethel schoolhouse. During 1878 Rev. C. L. Nye held a revival meeting and secured a number of converts. From time to time preaching was conducted by the different circuit riders and in 1885 Rev. A. E. Griffith organized the first Methodist class, the following persons being the charter members: John Hoop and wife, J. M. Humphrey and wife, J. P. Clair and wife, J. S. Sweeney and wife, C. H. Nieley and wife, and Jacob Wolf. Preaching was held at this point for years, the pastor at Greenfield supplying the work. Later the point was turned over to the Atlantic District and made a part of the Stuart Circuit, and the Hoadley schoolhouse two miles north was used for the services. Here, as at the other point, many precious meetings were held and frequently large numbers taken into the church, perhaps the greatest ingathering being during the ministry of Rev. T. W. Tippett in 1890. The first Sunday school superintendent in Hoadley was J. M. Humphrey, who after one year's service moved to Grove Center. As the class grew the agitation for a new church building was pushed. One effort was made to build Clara Chapel, and the cyclone came and the work was abandoned, but on February 2, 1902, Rev. Fletcher Brown dedicated the present structure while Rev. Alonzo Pruitt was pastor and the building was named after Clara (Nelson) Frizell, a sainted soul who had at about that time passed to her reward. 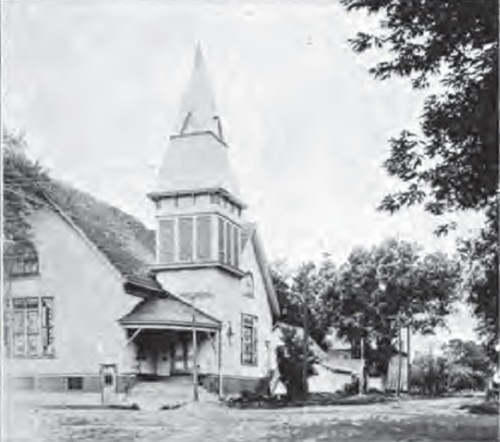 The church at Penn Avenue, Richland Township, was dedicated in August, 1896. The cost was $1,600. This society was started in 1881 by the organization of a Sabbath school, through the efforts of a school teacher, Miss Peters, at the Gem Point schoolhouse. Homer Brooks was the first superintendent. Gary, Williams, Wilson, Gaines, Maybee, Bishop, Palmer, Hamilton, Pain, and Taylor were the names of some of the early members. It was called the Pennsylvania Avenue Methodist Episcopal Church. The Fontanelle class was first organized in 1862 by Rev. James Lisle, it being a part of the Greenfield Circuit. In 1871 it became a separate mission. In 1866 the society was reorganized with twenty members, and in 1867 Jackson and Richland congregations were formed. Then by the withdrawal of two members, Fontanelle was left without a Methodist organization. In 1868 Rev. E. A. Winning re-formed the class with two members and twenty probationers. In 1870 Rev. W. H. Records took up the work and in 1871 Fontanelle was detached from the Greenfield Circuit and the first parsonage built. The Rev. F. A. Goodrich was the first regularly appointed pastor to this charge. He was followed in 1872 by Rev. M. Sheets, then Revs. L. A. Shaw, J. A. Jefferson, C. Smith, C. L. Nye. In 1880 an addition to the parsonage was constructed and an organ purchased. The Methodist Sunday School was organized for the first time then and in the winter the members withdrew from the Congregational Church and went over to the German Church for worship. In 1879 they transferred their services to the old courthouse. In 1880-1 Rev. J. A. Wilson held the pastorate. In 1881, in the spring, $1,200 in subscriptions was given for the erection of a new church building. The cornerstone was laid on June 24, 1881, by the Masonic Order. At this time the Richland society became dissatisfied with the occupation of the Union Church by the Methodists and withdrew, forming a Congregational Church at Pleasant Grove. After Wilson as pastor, there came A. W. Armstrong in 1884; E. E. Ilgenfritz, 1886; Asahel Thronbrue, 1889; A. G. Forman, 1890; Socrates Weaver, 1892; John C. Hall, 1895; M. R. Harned, 1898; S. W. Maine, 1901; A. H. Rusk, 1903; W. H. Doyle, 1905; V. Voorhees, 1907; A. Breeling, 1909; J. W. Harwood, 1912; and the present pastor J. Owen Smith, in 1913. At present there are 200 members in the Fontanelle class, and in the Highland class, also supplied by Rev. Smith, there are 100 members. The Congregational Church of Fontanelle is one of the oldest religious societies in the county, having been organized in 1856 with the following members: J. J.. Leeper, Mrs. J. J. Leeper, Robert Snodgrass, Mrs. Robert Snodgrass, Cal Ballard, Mrs. Cal Ballard, Mrs. Nancy Parr, G. F. Kilburn, D. L. Smith, Evan Evans, Mrs. Mary Evans, James Ewing and Mrs. Margaret Ewing. Rev. J. Mather was the pioneer pastor and under whose instruction the church was formed. The following clergymen have filled the pulpit since; J. S. Davis, A. V. Horn, J. W. Peet, G. M. Orvis, A. W. Archibald, H. S. Fish, G. W. Dungan, P. R. Adams, William Brooks. The present pastor is Reverend Blakely. The church edifice, the first in the county, was erected in 1871 at a cost of $1,700 and was dedicated on June 4th of that year. The American Congregational Union donated $500 toward the building of that structure and the balance of the amount was raised here and the entire indebtedness paid before the dedication of the church. In 1883 a fine bell was purchased at a cost of $75. The first officers of the church organization were: J. J. Leeper and Robert Snodgrass, deacons; D. L. Smith, clerk; G. F. Kilburn, trustee. There are now 120 members of the Fontanelle charge and a good Sunday school of 100. The pastor also attends the Pleasant Grove church four miles south of the Town of Fontanelle. There are but fourteen members in the latter congregation. The United Presbyterian Church of Greenfield had its beginning in the '70s. A number of families of this religious faith settled in Adair County during the years 1875-6-7 and occasionally held services, being supplied with preachers at intervals by the Des Moines Presbytery during the fall of 1877. A church organization was, however, effected on February 16, 1878, through the labors of Rev. S. W. Lorimer, of the Presbytery of Nebraska, with the following members: W. L. Linn, M. A. Linn, J. H. Giffin, W. D. Giffin, J. M. Ross, M. J. Ross, Sarah Paisley, A. R. Morrison, M. A. Morrison, J. R. E. Sterrett, M. E. Sterrett and E. L. Rust. The first officers were: W. L. Linn, ruling elder; S. M. Paisley, J. M. Ross and A. R. Morrison, trustees. This church was supplied with preaching by the presbytery until the latter part of 1879. J. F. Martin was then installed as pastor by a commission of the presbytery on December 29, 1879, but had really presided over the church since the first of May previously. A church edifice was erected during the summer of 1881 and dedicated with appropriate ceremonies on August 21st of the same year by Reverend McMichael of Monmouth, Ill. The building was a frame structure, 38 by 60 feet in size, with 18-foot ceiling, and cost $3,000. The building was afterwards remodeled and was rededicated on January 11, 1899. This society has now become non-existent, and on February 10, 1914, the church property was sold to the Presbyterians and then moved to the lot four blocks southeast. The Presbyterian Church of Greenfield was organized on May 17, 1874, and incorporated on June 5th following. The organization was brought about through the labors of Rev. H. H. Kellogg, then the pastor of the church at Menlo, or rather Guthrie, as it was then called. The following were the first members: A. S. Carmichael, R. A. Carmichael, A. M. Hutchinson, Ellen Hutchinson, Adeline Morris, John Paulus, Elizabeth Paulus, Jane Reed, Martha Reed, Ellen Reed, Mary Reed, Asa Wilson, Hannah Wilson, Samuel Wilson, Mary Wilson, C. P. Gilbert and wife. The first officers chosen were: A. S. Carmichael, S. E. Morris and C. P. Gilbert, trustees; Asa Wilson, elder. The first pastor was Rev. C. Merwin, who attended from about the 1st of September, 1875, and considerable interest was awakened. Rev. C. H. Delong commenced preaching to this society April 1, 1877, and remained for a year. About this time a colony separated from the parent church and organized a class at Orient. Rev. W. P. Barth was the next to fill the pulpit, serving for two years beginning in the spring of 1879. The Rev. C. H. DeLong returned from Creston and preached alternately between there and Greenfield during the summer. On the 1st of November, 1881, he again took charge alone and served for several years. In 1882 the matter of erecting a church edifice was taken up for consideration. In the spring of 1883 this movement became a strong one and $3,000 was raised by subscription. A building was then erected, and dedicated in October, 1884, costing about five thousand dollars. Reverend DeLong remained in the field until 1886. Rev. K. J. Duncan came in April, 1889, and stayed until September, 1890. Rev. J. W. Knott acted as supply until October, 1892. Rev. John Young came in June, 1893, and was pastor until he resigned in September, 1901. Reverend Patterson acted as supply during the summer of 1901. Reverend Patterson acted as supply during the summer of 1901 and the Rev. G. M. Tourtelott acted in the same capacity until December, 1904. Reverend Carlstrom was here for one year and Reverend Buchanan came in March, 1907. Rev. A. A. Smidt came in July, 1909. The Presbyterian Church of Adair was organized on April 13, 1875, at a meeting held at a residence of Henry P. Starr by the Rev. J. C. Hanna. Ten members formed the first class, namely: P. M. Crawford and wife, J. R. Porter and wife, J. McKenzie and wife, Henry P. Starr and wife, James Campbell and D. W. Moss. H. P. Starr and D. W. Moss were elected elders for the first year; James Campbell, John McKenzie and Philander Crawford, deacons; D. W. Moss, P. M. Crawford and James Campbell, trustees. Rev. J. C. Hanna preached here for a period of two years, on alternate Sundays, and was succeeded by Revs. J. A. Walker, W. R. Smith, W. M. Graham, Bruce, Rankin, Kephart. The Presbyterian Mite Society attached to this church at Adair was instituted at a meeting at the house of Mrs. R. B. Brown on October, 4, 1877. The Catholic Church at Greenfield was started about twenty-seven years ago, meetings being held at irregular intervals at the home of Mrs. Homeyer. 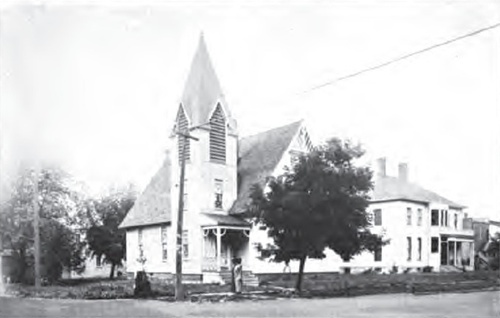 In 1908 a church building was constructed and later a parsonage. There are forty-five families in the congregation. Father Albin was the first pastor to serve this church, and the second and present pastor is Rev. J. P. Danahy. The Catholic Church at Adair was organized in the late '70s, with a frame building south of town. In 1895 a handsome church building was constructed in town and in 1905 a parsonage adjoining. The present membership includes about four hundred souls. The pastor is Reverend Mullen. The first services of the German Lutherans at Fontanelle were held in 1870 by Revs. Gottlieb Schenerle and Weiss, missionaries from Fort Dodge, Ia. Services in German were held at the courthouse at regular intervals, amounting in all to about three or four weeks, from that time until 1873, when a church and congregation was formed with the following members: John Ehrenfried, Fritz Kreis, George H. Bauer, Ed H. Heiman, Arnott Wuhman, John Mangels, John Bohling, Henry Welscher, Henry Krooss, Nik Leuthhauser, Fred Winter, August Fust, Jacob Bahlmann, Wilhelm Mehl. The first trustees were as follows: Edward Heiman, John Bohling, Henry Welscher, W. Mehl and George Bauer. The congregation, which was known as the German Evangelical Lutheraqn Emmanuel Church, erected a beautiful edifice for worship in the fall of 1873 and spring of 1874 at a cost of about $2,000. The building was dedicated on May 26, 1874. The pastors have been: Revs. G. Schenerle, L. C. Neumeyer, J. W. C. Noll, Joseph O. Zwicker, H. Freytag (1885-1902), Ernest Lehman, 1902, A. Zimmerman, 1909. There are at present 335 members of this congregation, of which number 227 are communicants and 71 voting members. During the Lehman pastorate a new $1,800 schoolhouse was built and a new parsonage, the latter costing $2,800. 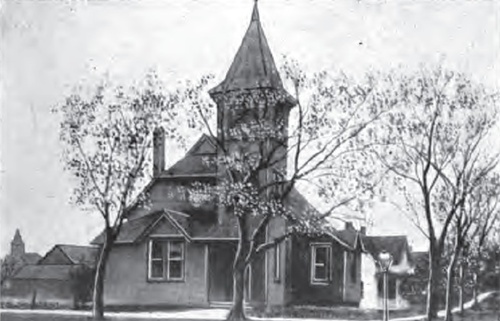 At a general meeting of the church on January 1, 1914, it was decided that the old church building was becoming too small for the needs of the congregation and that a new house of worship should be constructed. Accordingly all plans were made for this building. The drawings of R. T. Simmon of Bloomington, Ill., were accepted and the contract let to Heinz & Maloy of Creston for the sum of $10,282. The building was started on August 1st and the cornerstone was laid on September 20th. The whole improvement cost something like thirteen thousand dollars, most of which was given by voluntary subscription. The pastor and the young people purchased the pulpit, the stained glass windows and the altar; the ladies bought the pews and other furniture; while the magnificent pipe organ was the gift of Mr. J. F. Baudler and the First National Bank. The church has just recently, April, 1915, been dedicated. The cornerstone of the Lutheran Church, Immanuel's Congregation of Prussia Township, was laid September 7, 1913. This society was started in 1875 by the erection of a small frame church, 30 feet by 42 feet, on the Julius Sieg farm, where the new building is now located. The Anita Mission of the Evangelical Church of Jackson Township organized in 1874 with the following original members: G. H. Metzgar and wife, Margaret and Rosa Metzgar, August Rechtenbach and wife, Theodore and John Rechtenbach. The Anita Mission of the same church in Prussia Township was organized in 1876, with the following members: George Farewell and wife, John Erbes and wife, C. Schwambeck and wife, Ernest Funk and wife. The first pastor was J. P. Pflame. The Christian Church of Jefferson Township was organized in August, 1865, by William Deal and J. B. McGinnis. The first meetings were held at the Watawah schoolhouse, which was shortly afterwards purchased for church purposes by John Loucks and J. B. McGinnis. The building stood on the southeast corner of the northwest quarter of section 27, on land belonging to John Loucks. It was 20 by 30 feet in size. The original members of this class were: J. B. McGinnis and wife, John Loucks and wife, Francis and Hill Darnill, William Deal and wife. J. B. McGinnis was the first elder. William Deal and William Hopkins did the first preaching in this township. The Pleasant Christian Church of Jackson Township was organized March 23, 1880, with the following members: J. B. Sullivan and wife, W. J. Simpson and wife, A. E. Jackson and wife, L. Banister and wife, O. O. Farnham, A. Beaver and wife, Martha J. Lawrence, A. Lawrence, Edith Lawrence, E. H. Sullivan and Laura B. Stoner. The church was organized under the labors of Rev. William Gadd. Rev. O. E. Brown was installed as the first minister, being succeeded by Rev. Henry Davis. Meetings were first held at the Pleasant Valley schoolhouse. The Congregational Church of Orient was organized October 11, 1881. As they had no church building at that time, services were held at Sprague's Hall. In the early '80s a church building was moved into Orient from the country and is now used by the society. Rev. R. R. Adams was the first minister to preach after the organization had been effected and Rev. James Orvis preached the first sermon in the new building. This was on July 6, 1884. The following were the first members of the church: J. N. and Mary A. Colby, Mr. and Mrs. Batie, Mr. and Mrs. S. N. Garlock, Mr. and Mrs. C. H. Slocum, Herman D. Stowell, Mr. and Mrs. F. M. Collins. The church was incorporated January 27, 1882. The Congregational Society in Orient at the present time has a good membership, about 200, and hold regular services. The Methodist Church at Orient first effected an organization about the year 1870 or 1871. Services were held first at Sprague's Hall every two weeks. The following are the names of the first members of this church: Maria Hastings, John Garmon, Mary Garmon, Hilda Spencer, D. E. Mitchell, Almira Witham, Caroline Mitchell. Rev. John Walton was the pioneer minister of this organization. 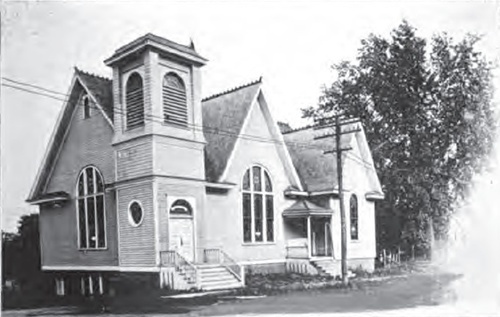 In 1900 a new church building was constructed by the society. There are 200 members in 1915 and the church is in good financial condition. The church building of St. Mark's Catholic Church of Orient was built in 1901. At this time there were about twenty-five members. This society had been in existence for about twenty years previous to this time and had held bi-weekly meetings at the home of M. Hennessy, one of the strongest supporters of the church. Father McKeever was the first pastor to hold services in the town. There are 100 members at the present time and the church is supplied by Father Danahay of Greenfield. The Baptist Church of Greenfield was organized during the year 1874. Among its first members were found William Rodgers and wife, A. L. Harrison and wife, Ranson Patrick and wife, G. E. Hamlin and wife and possibly others. Reverend Birch was its first pastor and under him and his immediate successors, services were held in the courthouse, in the schoolhouse, and in 1882 with the Methodists. In 1883 they built the house of worship they now own and which, together with the lot on which it stands, cost $4,000. Among its first pastors were the following: Revs. Birch, Barnes, Williams, Wm. Carpenter, Berry, Burr and Anthony Jacobs. The largest growth in membership to date seems to have been during the pastorate of A. Jacobs when the previous membership of about sixty was more than doubled. About the year 1882 services were discontinued, the house remaining closed until September 14, 1890; a little band met for the purpose of organizing a temporary Sunday school, G. E. Hamlin in the chair. The following officers were elected: Miss Alice Taylor, Mrs. W. G. Bell, Miss Mabel Jones, Miss May Sampson, Minnie Hetherington, Abe Swisher and Emma Vincent. The Publication Society furnished the first quarter's supplies. The attendance, September 18th, was twenty-eight, thus the number increased until a permanent Sunday school was organized by R. A. Smith, district missionary, on February 28, 1892. This time the officers were: J. F. Walter, Clara Bell, Mrs. W. G. Bell, J. C. Crawford, Maud Carson, Stella Rice and Minnie Hetherington. At this time the property was about to be sold to satisfy judgments for nearly five hundred dollars. The misfortunes of the past made all very much discouraged and many hopeless. Through the advice of Rev. N. B. Rairdon, the secretary of the state convention, plans were set on foot to clear the indebtedness. A sale of forty feet off the north end of the church lot was effected to R. Wallace for $200. Pledges for the rest were soon obtained. On August 19, 1892, a council was called which consisted of delegates from Creston, Liberty and Forest Avenue, Des Moines, churches for the purpose of recognizing the new organization as a regular Baptist Church. The council organized with Rev. H. J. Powell of Creston, moderator, and E. R. Daniels of Stuart as clerk. Others assisting in the recognition services were C. F. Petzoldt. Rev. J. W. Knott, pastor of the Greenfield Presbyterian Church, gave the charge to the church; hand of fellowship by E. R. Daniels, and benediction by the supply pastor, J. Y. Aitcheson. Among the pastors who have served the church to date are: J. Y. Aitcheson, W. C. Shepherd, E. R. Tucker, L. A. Lovelace, George Kline, Amos Weaver, E. Bodenham, T. F. Clark, J. A. Armstrong, H. M. Peterson, Amil A. Oestreich, Orr Campbell, R. T. Butler, Charles H. Sloan. W. L. Anderson is just entering on his pastorate, May 1, 1915. Several of the above named pastors served only a few months as supply pastors. During the year 1895 was a very trying time, but through the faithfulness of a few the Sunday school, prayer meetings and B. Y. P. U. were kept up. Those who have served as superintendent of the Sunday school are Mrs. M. L. Hitchcock, Maude Hitchcock, J. F. Walter, Dr. G. E. Thweat, P. P. Clement, B. F. Garmer, Dr. E. Babcock, Myrtle Rivenburgh, Omer Vandivier, Dan Shaw, James Harrison, Alice Taylor, W. G. Bell and A. J. McFarland. 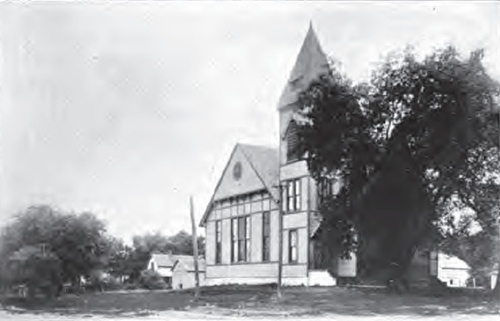 The year 1903 is prominent in that there was the largest ingathering of new members; 1906, repairs on the building to the amount of $600 were made, and the pastor, H. M. Peterson, ordained to the ministry. In the year 1914 two sides of the church lot, which is one of the best located in the city, were paved and imposed quite a financial burden upon the little flock of faithful workers. The membership list was recently revised and numbers today about forty resident members and twenty-five non-resident members. That which deserves the most honor and which is worthy of the most praise since its organization in the year 1892, is the fact that the church has kept up the work in its auxiliary societies and its midweek and Sunday services with the exception of preaching services, even when pastorless for several years at a time. The most discouraging feature has been the loss by removal of leaders and financial supporters. Church buildings other than those mentioned before have been erected as follows: Grand River Congregational, moved to Orient; Henron Methodist; Hill of Zion in Union Township; Christian, Wilson Chapel Methodist; Gem Point Summerset Congregational; Brush Church Richland Congregational; Otis Chapel Methodist; Avondale Methodist Washington; a Catholic Church in Jackson; two churches in Eureka; Methodist at Highland in Prussia; and a Quaker Church at Canby in Walnut Township. A Christian Church was built at Fontanelle and a Seventh Day Adventist Church, both of which had a strong membership for some years, but most of the members either moved away or died and the churches have been little used in recent years. The Mormons have had an organization at Fontanelle, with occasional meetings for more than fifty years, but have never erected buildings.